Peridot, the August birthstone, is one of the most sought after green gems, and is said to bring the wearer luck and a sense of tranquility. It is known for its glistening yellowish-green hue. 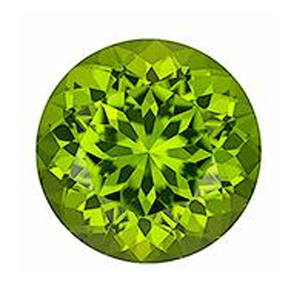 Ranging from a lime green to olive color, and sometimes a deeper brown shade, it is without a doubt that peridot is a gorgeous gemstone. This article takes a close look at this August birthstone, including its history and how you can land yourself astonishing custom made jewels. 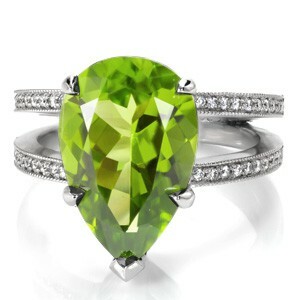 Peridot is the gemstone form of olivine, a common mineral that is found in lava rocks. The gemstone forms deep inside the earth, and is brought to the surface by volcanic action. It is mainly found inside lava flows in countries like China, the U.S and Vietnam. It can also be found inside solidified molten rock in some regions – Pakistan, Mynmar and Zabargad. In some rare occasions, it can be as a result of extraterrestrial activity, being found inside fallen meteorites. Peridot is chemically composed of Iron and Magnesium. It is one of the Idiochromatic gems, meaning it derives its color from the chemical composition rather than its impurities. It thus exhibits a narrow range of colors. 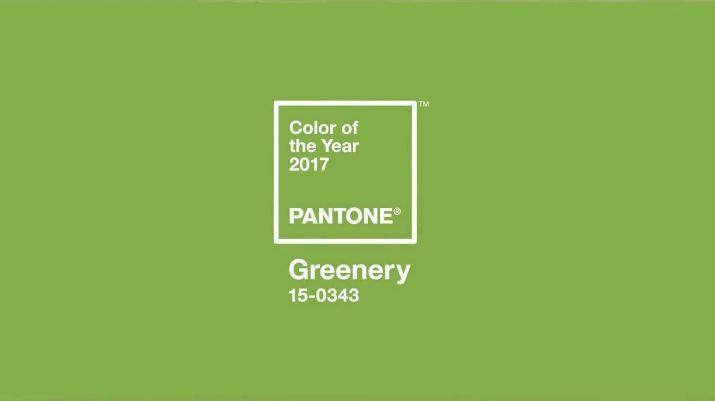 It is found in shades of olive green, lime green and a brown-green to yellowish green hue. 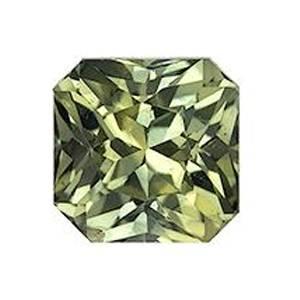 The yellowish-green color is the most common shade found in august birthstone jewelry, and it is a result of the iron content. Peridot produces a soft, light green glow under artificial light, which has earned the name “the evening emeralds.” The gemstone is associated with peace, prosperity and goodness. In Hawaii, the stone is believed to represent the tears of Pele, the goddess of fire and volcanoes. 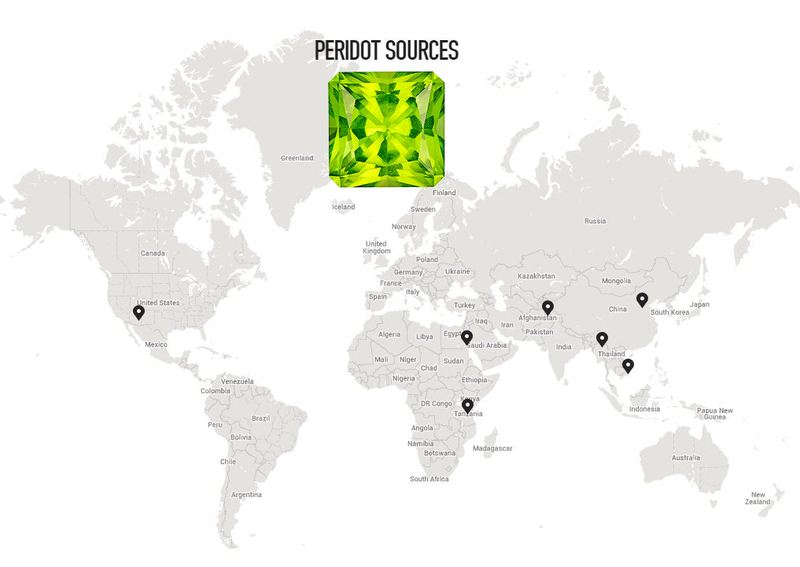 Peridot is among the oldest known gemstones. References of the august birthstone go all the way back to the Bible, where it is referred to by its Hebrew name “Pitdah”. It is believed that “topaz”, which was on the breast plate of the High Priest Aaron in the Old Testament, was actually a peridot. Historically, the gemstone was used to create beads during the Ancient Egyptians era around 1580 B.C to 1350 B.C. The Egyptians associated it with light, and it was even referred to as the “gem of the sun.” On top of being used to create beads, it was believed to protect the wearer from evil. The Egyptians mined the stone from a Red Sea island called Topazios, the current day Island of Zabargad. Peridot was also popular gemstone in other early civilizations. In Greece, it was believed to bring dignity to the wearer. 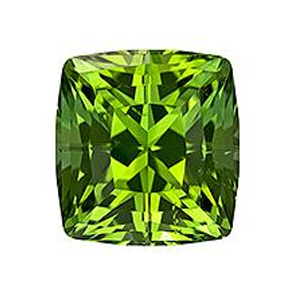 It was also a prized gemstone in the Ottoman Empire, as well as among the Turkish Sultans, who are believed to have owned the largest collection of peridots in the world. 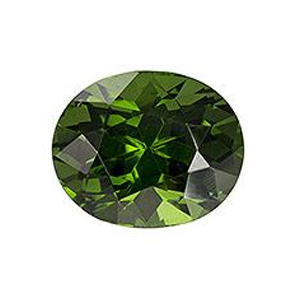 Throughout history, peridot gemstones have been confused with other gems. 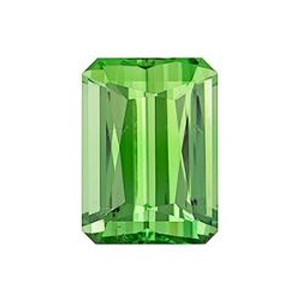 It is one of the many gems that have been referred to as “topaz.” It is also believed that the famous gemstones worn by Queen Cleopatra were in fact peridots, and not emeralds as many people believed. 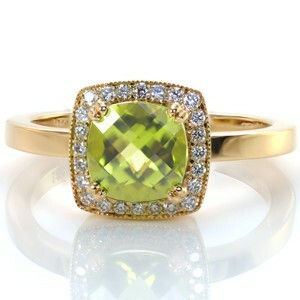 Today, peridot is one of the most prized gemstones, mainly due to its soothing hues and its long, colorful history. If you are in search of custom created august birthstone jewelry, Knox Jewelers is the place to be. We specialize in crafting custom designed jewelry, ranging from engagement rings to pendants and earrings. 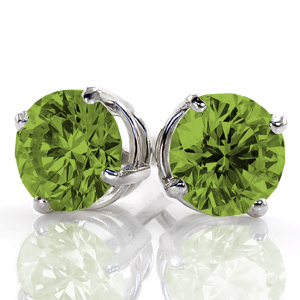 Peridot gems are a perfect birthday gift for people born in August. You can consult with Knox Jewelers to create an original design for the perfect birthstone jewelry. Here at Knox, we have a wealth of experience in creating custom masterpiece jewelry from gemstones, having been designing engagement rings and other jewelry for decades. We employ skilled artisans who are always at hand, ready to make your dream come true. Our jewelry is of the highest quality, and it is guaranteed to stand the test of time. 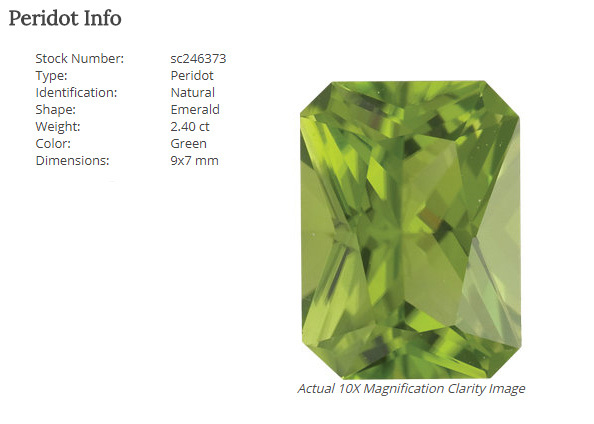 To own a custom design of peridot jewelry, contact one of our knowledgeable consultants today.